For the first time in the history of the competition two teams from the same city met in the final of the Champions League. Atlético Madrid, recently crowned Spanish champions (at the Camp Nou, no less), were facing Real Madrid, still in search of the ever elusive Décima. Given the injuries and suspensions on both sides, there were no major surprises on the teams' line-ups apart from the impressive Raphaël Varane in Pepe's place, with Sami Khedira offered the spot that usually belongs to Xabi Alonso. On the colchonero side, Diego Costa managed to recover only to limp off after a few minutes had elapsed, making way for Adrián. The pattern of the match pretty much followed the expected pattern. Unlike last week at Barcelona, Diego Simeone instructed his men to stand down and exert no pressure as Real Madrid centre-backs tried to bring the ball out from the back. Rather, the new Spanish champions were virtually defending in some sort of 4x6x0, with both David Villa and Diego Costa placing themselves close to their midfield so as to force their opponents to play outside their compact block. The colchoneros were all too happy to cede the initiative to Carlo Ancelotti's men, who have always looked most vulnerable this seasons where they were offered the time to build up play, rather than relying on deadly quick transitions based on Karim Benzema, Cristiano Ronaldo and Gareth Bale. 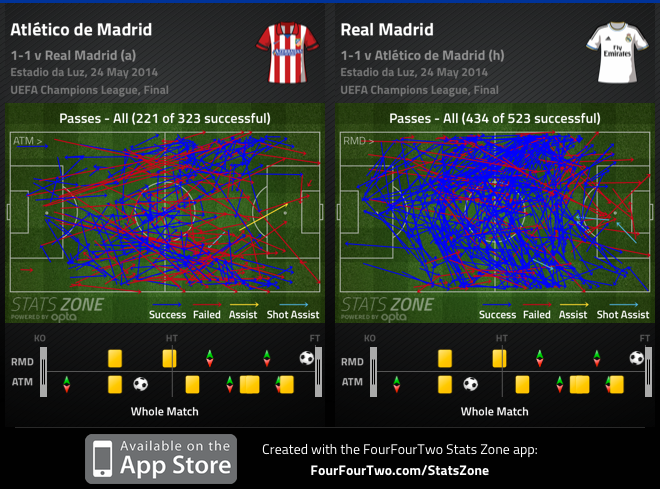 Real Madrid managed to complete almost twice as many passes as Atlético. With Raúl García deputising for Arda Turan, Atlético's right wing was even tighter defensively, with García offering invaluable help down the left, where Fábio Coentrão and Ángel Di María tried to find a breach in Atlético's hard-knit defensive unit. In fact, Di María's part was the most interesting from a tactical point of view, since he was being asked to act as a shuttler while defending - deployed ahead of Khedira and alongside Luka Modric - and as a winger when the team attacked. The knock-on effect was that Cristiano Ronaldo, clearly playing with severe physical limitations but unwilling to relinquish the chance to win the club's tenth cup and his second, was allowed (and instructed) to get into more central positions, closer to Benzema, probably because the Portuguese was not able to put in his blunt sprints. Ronaldo was physically unavailable for sprinting and was more of a central presence. While this approach is far from an absolute novelty this season, it seemed strange that Ancelotti would make such an option here, since Ronaldo seems to struggle whenever he's asked to play as a central forward: On one hand, there is a lot less space for him to move into given the greater number of players in that area and, on the other hand, not only he is forced to play with his back to goal, but he also relinquishes the possibility of running at defenders with his incredible speed. Di María was asked to perform two roles, but as time went on, he became an out-and-out winger. Atlético, in turn, did not appear in any way surprised by Reals strategy and were in fact aiming their long ball to the left side of Khedira, who was clearly lacking in match fitness. Not only did Di María was absent due to his attacking forays down the wing, but Atlético also had Raúl García down the right - an option that paid great dividends against Barcelona in the competition's semi-finals, where he made the most of the height mismatch between Jordi Alba and himself. Following Bayern Munich's dismantling in the previous round and Barcelona's falling at the seams under the leadership of Gerardo Martino, it seems possession-based football will be that much harder to come by. In fact, both Real Madrid and Atlético were clearly interested in taking full advantage the moment their opponents lost their balance while attacking. All things considered, that was pretty much what happened, as both sides only looked dangerous on the break or following a mishit pass (Tiago's first-half slip-up immediately comes to mind). Other than that, neither team were able to create anything of note in possession with their opponents sitting in front of them, further showing both sides' willingness to prey on the other's mistakes. Adrián, Diego Costa's replacement, acted even more as a midfielder, protecting his midfield team-mates from up front, but offering precious little offensively. 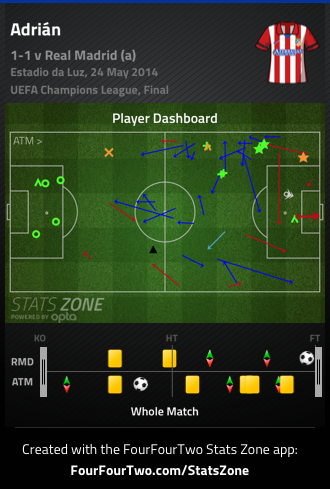 Adrián offered a helping hand defensively, but did not contribute much up front. Nowadays there seems to be little arguing about the game's four phases of play: attacking organisation, defensive transition, defensive organisation and attacking transition. 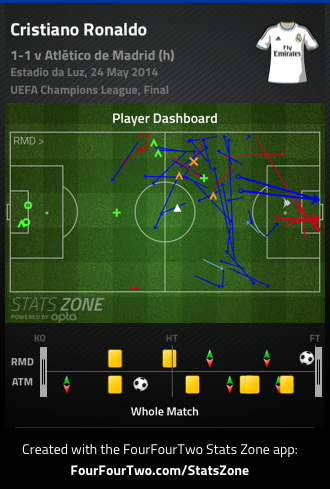 There were some who started mentioning a fifth phase of play: Set pieces. With football tending to evolve towards greater and greater athleticism and a diluting of major tactical differences (the Premier League notwithstanding), there seems to be a lot of sense in the "fifth phase of play" approach. In fact, given that neither team were exactly impressing with their ability to penetrate enemy lines, this was probably the phase that paid the highest dividends and one that will probably attract more and more attention down the line. Not only did Atlético tilted the match their way after a 38th minute set piece dismally dealt with by Iker Casillas (who revealed one of the biggest faults in his game: aerial balls), but Real Madrid would finally find the goal they fought so long for during the second half on the 94th minute via Sérgio Ramos, ever crucial in these passages of play as error-prone in open play. 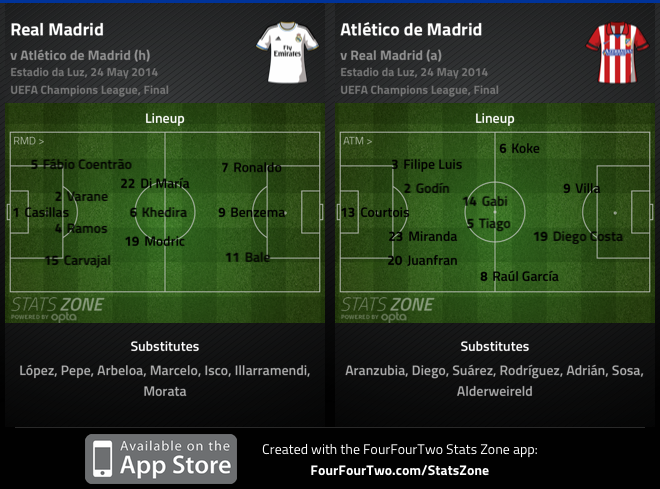 Diego Simeone and his men have been praised - and rightly so - for their high intensity, take-no-prisoners approach. Adept at defending compactly and breaking quickly, the colchoneros often work miracles during first halves, only to struggle (not just) physically as time goes by, since that approach is clearly unsustainable. Indeed, they progressively retreated into their own half, not as a strategic move trying to lure Real Madrid into a false sense of security, but rather due to the inability to compete physically. Even though Real Madrid themselves were not exactly able to create numerous clear-cut chances, it was becoming progressively clear by the minute that Atlético were running on empty and that a Real Madrid goal would not be followed by an offensive stampede from Simeone's charges. 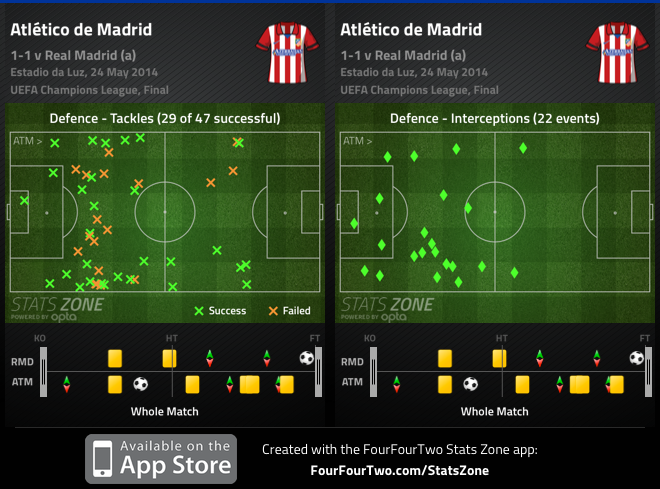 Atlético Madrid were clearly not interested in pressing Real Madrid high up. The number of clearances made by Atlético inside their own box is staggering. The last-minute ditch fest that took place for most of the second half was an invitation for Real Madrid to exert even more pressure unto Atlético's already tired defence. Had Xabi Alonso been present, for instance, Modric would have been able to play higher up and assume even greater importance while running the show (his impressive display will likely be forgotten under the due compliments to Di María or Gareth Bale). Wearing the champions crown will surely force Atlético Madrid to be more proactive in more matches, which will be a testing challenge in itself. Carlo Ancelotti won his fifth Champions Leage/European cup both as player and manager, but he was probably a minute away from being shown the door, had Sérgio Ramos failed to blast the ball into the net. The European success will certainly paper over many cracks that were plain for all to see - the inability to create danger when opponents do not offer space behind them and a certain difficulty in winning against strong (mostly) domestic opponents, the impressive destruction of Bayern Munich notwithstanding. A third-place finish is clearly not enough for Real Madrid, even though the European success will help all of that pass by. As for Atlético, it would be hard to ask a whole lot more of them. With so many injuries, suspensions and without a deep squad, the physical side of things was bound to catch up on them. Simeone's high intensity style, while effective, leaves a mark on players. It remains to be seen if, not unlike Jürgen Klopp's, his approach will not be unsustainable in the long run.